I just started listening to http://songexploder.net/ after being recommended it a ton of times. The reason I finally took the plunge was being recommended it by Pocket Casts, which I just switched to from Podcast Addict. Unsubscribing from a podcast is hidden in the settings for a podcast. You can easily mass mark episodes as listened to, but to mark them as unlistened, you either have to add them to a playlist, or go through one by one, which is a pain. Internet of Things: Haven't listened to yet, was recommended. Science Friday: I listen to one or two a month. These are pretty hit or miss. Reconcilable Differences: New Merlin Mann. I love his stuff, but I'm not sold on this yet. What's The Point: I like @fivethirtyeight's writing, and these have been good so far. Roderick on the Line: Good, but I can only listen to one or two a week before I get overwhelmed. Highly recommend starting at the beginning, it's just so many inside jokes now. I usually listen to the newest episode and an older episode each week. Rachel and Miles X-Plain the X-Men: A couple tries to explain x-men plot lines. Hilarious. 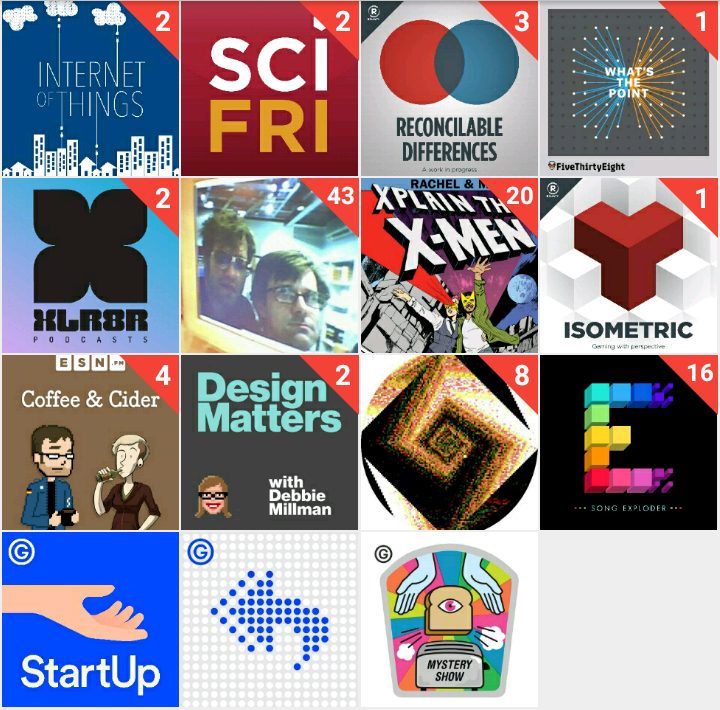 Isometric: Recommended, have not listened to yet. Coffee & Cider: I love these two, but I'm not sold on it yet. It's like a short Roderick. Design Matters: The best design interviews out there. I think in my three or four years listening I can only remember one bad interview (the episode she interviewed the two guys from Mailchimp). Sufficiently Human: Good, but I think they stopped making them. Song Exploder: Great discussions on song creation by the artists themselves. Startup: Each season follows a startup. ReplyAll: Interesting stories from the internet. I really love their Yes, Yes, No segment where they explain internet phenomena. Mystery Show: Weird premise, but cool stories about weird mysteries. Ok, so this has been bothering me. And I keep forgetting to actually figure out the right solution. When I did my interview with LittleBits, I was asked to invert an array, without using a standard library reverse function. Picking Ruby to solve the problem, I immediately froze up. Makes me want to travel! Some interesting technical articles. Discussion of client side SSL certs, optimizing PNGs, Twitter's Architecture, HTTP 2.0 and Japan's file sharing ecosystem.